2,320 people read this post. Allah Ta’ala’s love for His Prophet Muhammad (Sallallaahu ‘alayhi wa-Sallam) is clearly evident and manifest in many Ayaat (verses) of the Qur`aan Shareef. Additionally, whilst other Ambiyaa (Alayhimus Salaam) were gifted with exclusive titles, it was Rasulullah (Sallallaahu ‘alayhi wa-Sallam) alone, whose title was “Habibullah” (The Beloved of Allah). Due to this Divine love for Sayyidina Muhammad (Sallallaahu ‘alayhi wa-Sallam), his Ummah is recipient to special mercy, blessings and favours from Allah Ta’ala. It is only due to our connection and association with Nabi-e-Akram (Sallallaahu ‘alayhi wa-Sallam) that Allah Ta’ala has honoured us above all people. Amongst many privileges, one Divine Mark of Distinction that has been granted to us, is the great privilege of being “Ummate Marhooma” – The Ummah upon whom Mercy is shown. The explanation of this noble title, “Ummate Marhooma” is that forgiveness is secured and mercy is attained through our sicknesses, our hardships and other tribulations; through the Eesale Sawaab that people convey to us after our demise, and through blessed days and nights such as are found in Ramadaan, and other special days and nights outside Ramadaan (The first 10 nights and days of Zul Hijjah, the nights of Eid, the 10th of Muharram, etc. ), whereby we can easily gain forgiveness. The most special and most blessed of all nights is the Night of “QADR”. Laylatul Qadr is a night singled out by Allah Ta’ala, who granted it such magnificent virtues and such greatness that surpasses all other nights. The fact that Allah Ta’ala has gifted this Ummah, with this one night – year in and year out – highlights again the Divine mercy that is extended to this Ummah, as well as the Graciousness and Kindness of Allah Ta’ala in giving us opportunities to secure far more in rewards. “Qadr” also means “pre-destination” and we find that this is also a night where the destinies of people are assigned to respective Angels in regard to life, death, sustenance, rain, and so forth – all of which will come to pass for the year that will follow. Drawing from the different narrations, it becomes clear that the Night of Qadr should be sought in the last 10 nights of Ramadaan, specifically the odd nights. Its greatness and merit is described in the Speech of Allah Ta’ala, wherein it is stated that worship in this night surpasses the worship of 1000 months. Worship includes Salaah, Tilawah (recitation) of the Qur`aan Shareef, Zikrullah, Dua, etc. May Allah Ta’ala grant us appreciation of these beautiful opportunities, and grant us the experience and rewards of Laylatul Qadr. It is not possible to do justice to a discussion of Laylatul Qadr but an excellent and detailed exposition is found in the book “Fazaa`il-e-Ramadaan” by Shaykhul Hadeeth, Hazrat Maulana Muhammad Zakariyya (Rahmatullah ‘alayh), which offers tremendous inspiration, motivation and encouragement. 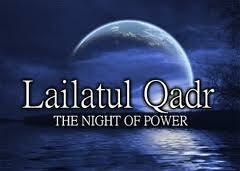 Next Laylatul Qadr-The Night of Power!